We are already halfway through Lent, which means Easter will be here before we know it. While our minds may wander to thoughts of food and family, parties and planning, we must also focus on what makes this joyous occasion possible. Without Good Friday, there is no Easter Sunday, and without Jesus’s sacrifice on the cross, there would be no resurrection, no ascension into Heaven, and no eternal life in God’s Kingdom for any of us. It was all made possible by that selfless act, by Jesus resisting the Earthly desire to avoid the pain and torture of his bodily death and instead accepting the cup God had placed before Him for the salvation of the world. Jesus’s act on the cross was all about His love for us. God Almighty humbled Himself to take human form so that He could be spit on, derided, mocked, scorned, abused, tortured, and executed all so that He could save the very souls of his mockers, his scorners, his abusers, his torturers, and his executioners. It takes such incredible humility to be able to love the way Jesus does. It takes incredible humility to be willing to lay down one’s life for another, because in doing so, one must recognize that someone else is more important than he. Sometimes, this does not even seem just. I look at Jesus, fully human and fully God, laying down His life for my own, and I cannot help but think that was light-years away from an even trade. But, the point of Jesus’s sacrifice was not to enforce worldly justice, but to introduce a new law, one higher than the laws of justice. It was to offer the world the Heavenly Law of Love, and the essences of this law are mercy, forgiveness, charity, and sacrifice. This leads to an undeniable conclusion. 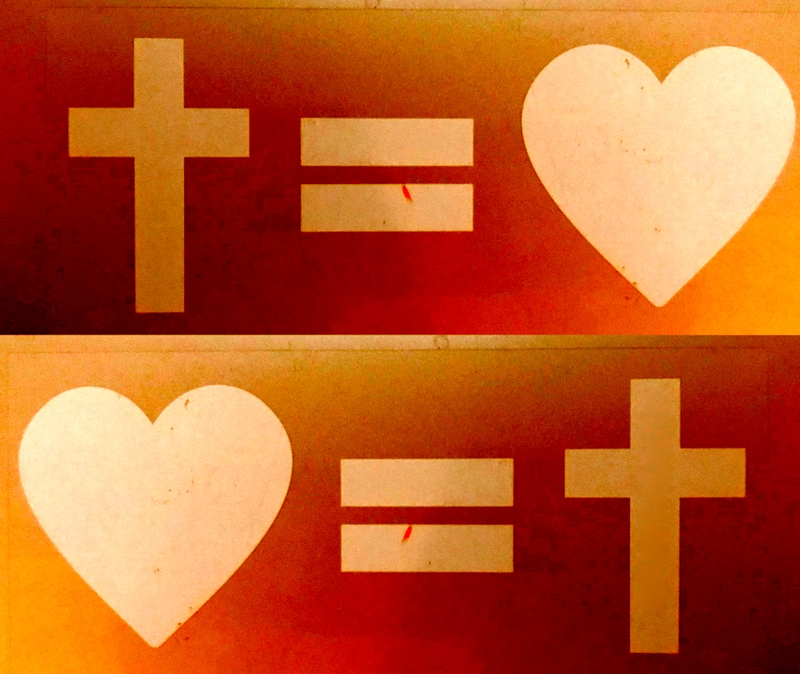 If the bumper sticker “cross equals love” is true, then its inverse must also be equally true. In mathematics, the symmetric property of equality holds that reversing the order of an equation does not change the value. In other words, if 2+2=4, then 4=2+2. So, if “Cross Equals Love” is true, then “Love Equals Cross” must undeniably and absolutely also be true.